We were contacted by our client to request that we carry out a survey to a damp vault which was situated under the external pavement. Following her request our qualified damp surveyor attended the property to inspect the area and take readings using a hand held damp meter and a thermal imaging camera. Some damp proofing had previously been carried out but this was only to a part of the room. Considerable water ingress was found to be entering some areas which was making the room uninhabitable. It was decided by our damp surveyor that the safest and best course of action would be to completely remove the existing damp proofing systems and to install a completely new Cavity Drain Membrane (CDM) system, incorporating a sump and pump, to discharge water to a place chosen by us. Following instructions from our client, to commence the work, our trained operatives removed the existing damp proofing materials and took them to a place for disposal. The floor was excavated and a special pump chamber installed. The concrete floor was excavated around the edges and special drainage channels were installed to discharge water into the sump. 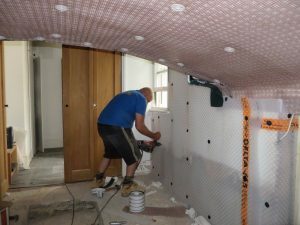 The high density polyethylene studded Cavity Drain Membrane was installed the walls using special fittings and the larger studded membrane was laid over the floor, connecting the two the with a special floor wall joint. The pump was then installed and pipe work fitted, to discharge water to a place designated by us. What was a totally unusable, wet, under pavement vault was transformed into a dry, warm living space. Not only has it provided addition living space for our client but it has also added value to their property, well in excess of what it cost to damp proof. Cavity Drain Membrane systems installed by us are covered by our 20 Year Guarantee and insured by Guarantee Protection Insurance (GPI). We have been damp proofing basements, cellars and vaults in London and the Home Counties for over 46 years. We are long term members of the Property Care Association (PCA), The Basement Water Proofing Association (BWA) and Trust Mark (Government Endorsed Standard). We are also a 5 star Which? Trusted Trader.